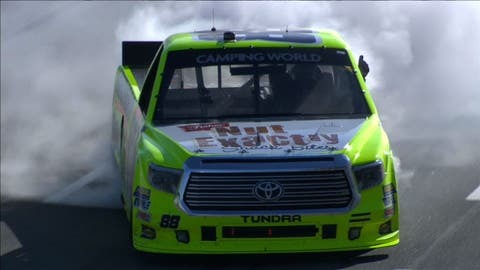 Matt Crafton won the caution-filled Kroger 200 Saturday at Martinsville Speedway, closing the gap in the Camping World Truck Series points standings with just three races remaining to decide the 2015 championship. Crafton, the two-time defending CWTS champion, survived the race as much as he won it. "This feels very, very good," Crafton said. "It’s been a trying last two months for us. But we finally got this thing back in Victory Lane." The final wreck on an afternoon full of them came with eight laps to go, setting up yet another restart with two laps left. With his teammate Cameron Hayley on the outside of the front row next to Crafton on the inside, Crafton executed a perfect restart and drove off to the victory. It was Crafton’s series-high fifth victory of the season and drew him to within 10 points of the lead in the series points standings. Erik Jones battled through adversity to finish a respectable 10th, maintaining his lead in the series points standings with only races at Texas, Phoenix and Homestead-Miami Speedway remaining on the schedule. The win helped Crafton overcome a poor race last weekend at Talladega Superspeedway, which caused him to fall 23 points behind Jones heading into Saturday’s race at the Martsinville short track. Tyler Reddick finished fifth to also slice into Jones’ lead. Jones leads Reddick, who is third in the standings, by 13 points. "We were in really good position at the end … and I actually hit the curb and cost us a couple more spots," Reddick said. "It was as clean as Martinsville could get. It’s a shame we got fifth, really, because I thought we could have finished third or second. "But that’s how this place goes. We could have got wrecked on the last lap and finished 20th, or last on the lead lap. So we’ll take it and go on from here." John Hunter Nemechek finished second in Saturday’s race and was followed by Hayley, pole-sitter Cole Custer and Reddick. Custer had to overcome a costly pit-road speeding penalty with 70 laps to go that dropped him at the time from second place to 25th. "We weren’t very good on the short runs," Crafton said. "But I never give up on these guys (on his pit crew), and they kept fine-tuning it, fine-tuning it. … (Crew chief Carl) Junior (Joiner) called an audible there toward the end where we made a change and it was really good. Then I just had to pace myself and make sure I saved enough tires for the end of the race."